My little niece went sliding for the first time over the weekend, and reminded me of times sliding back home. Generally we didn’t have the plastic slides you see today, the fanciest we had was a crazy carpet. Most times sliding involved a toboggan, or the old fashioned coaster you see here. 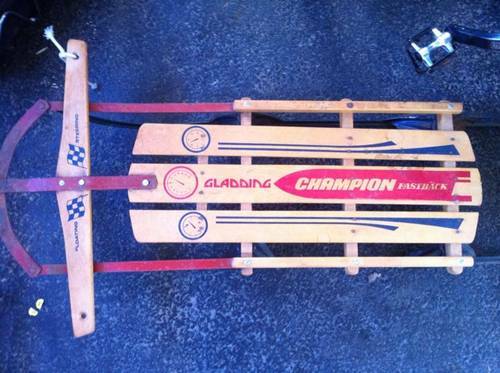 These didn’t really work unless you had hard crusty snow, or more likely for my sliding career at least, ice from hard packed ski-doo paths. You were “supposed” sit on the coaster and use your feet to steer by using the handle, and sometimes I did that. But more often, I lay on my stomach on it and steered using my hands. Two rides stand out. The first was towing the slide all the way in to the “level”, a named spot in the woods near the house where the ground leveled off for a bit after having climbed all the way into that point. There was an old slide path (a path made for use by a horse and slide to pull wood) coming from there to the old school garden, and then turning down the hill, and heading down near the church. Quite a long long ride, made even longer by previously opening the gates on Ross Smith’s garden and sliding all the way to the beach. Awesome log ride and a fair rate of speed as it was downhill the whole way. The second ride that stands out was partially because it was the last. Up over the hill from us Uncle Lionel Kelly had his house. It sat on a level spot with a grassy hill rising towards that same “level” from a different angle. This year, that hill had iced over completely and was a kids speed dream on the old coaster. Dad had gone up to visit Uncle Lionel, and/or his son Sam, and I was up on the hill with the coaster. After several high speed runs, on my stomach of course, I came down one last time, being the last because of what happened. Somehow, the coasters runners got caught in a rut, and there was no way to steer it. I hurtled along on my stomach and proceeded to slam into the house. I don’t recall how hurt I was, do remember being scraped and a little bloody, and walking into the house to get Dad. That was it for the old coaster, not as punishment or anything, but because I broke it in three pieces on that last ride. And probably hope your runners didn’t get caught in a rut!